Linda Salinas, a history teacher at Harlingen High School, joined an elite group of educators last July when she was selected for the Humanities Texas Award, only 16 teachers in the state are recognized with this award. 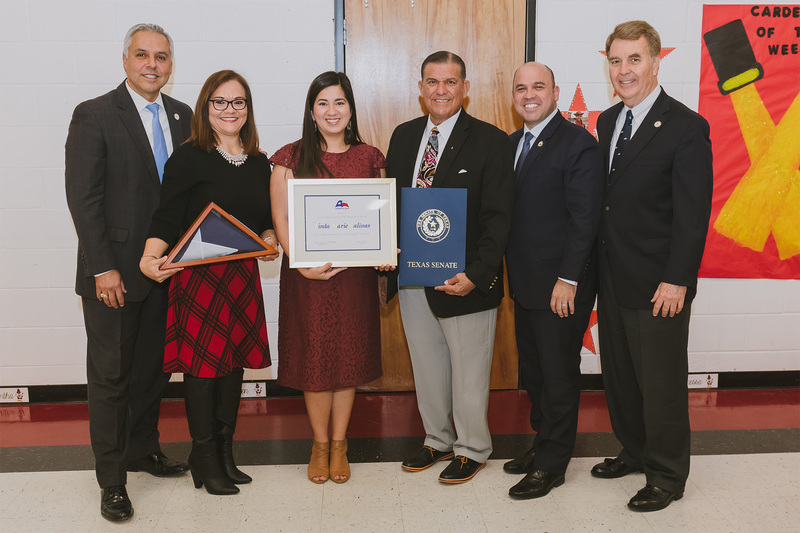 On Jan. 21, she was celebrated for this accomplishment with many in attendance, including Harlingen CISD’s Board of Trustees and Senator Eddie Lucio Jr. who spoke highly about Mrs. Salinas and her teaching techniques. Every individual in the room that day was filled with pride as Salinas was presented with her award, including many of her colleagues. Nominating her for this recognition was none other than her former student, Oziel Landaverde, who also had the opportunity to express his joy and gratitude. “I’m really happy Mrs. Salinas is in my life, and I nominated her for a reason, she’s probably the most influential people in my life. I dare to say I wouldn’t be at UT Austin or as successful as I am right now without her. I am proud of her and thank you for being a big part of my life,” he said. Alongside many of Salinas’ achievements, this award is another feather in her cap that accentuates her outstanding teaching methods and passion for her students.